For beekeepers, spring is an important time. The bees are breeding and may start to swarm. On a humid day in late April, Li Xinrui trekked into the deep valley where his and other local beekeepers’ hives are located. Wildflowers in various colors scattered the roadside, while purple and white rhododendrons blossomed higher up on the mountain slopes. Passing an abandoned wooden shelter, Li Xinrui told Mongabay it used to be a sheepfold owned by his family, where over 100 sheep could stay. “There were a total of over 50 cattle and 500 sheep scattered in this valley, but since 2009 when we launched beekeeping as an alternative livelihood among villagers for the sake of nature conservation in the valley, the total number of cattle and sheep went down to less than 10 and 100 respectively,” he explained. Guanba villagers, including Li Xinrui (middle), on their way to check their beehives in Guanba valley. Photo by Chen Yuanming. Guanba valley isn’t exactly wilderness, but its secondary-growth forest is verdant and well protected. The valley is located in Pingwu County in northwestern Sichuan, about 300 kilometers (186 miles) from the city of Chengdu. It forms an important migration path for endangered giant pandas (Ailuropoda melanoleuca) traveling between several nearby nature reserves that are home to dozens of the animals. According to the latest giant panda survey of the area in 2012, six or seven pandas live in the valley itself. Guanba valley also provides drinking water to the 900 or so villagers living in the region. Map shows Guanba in Sichuan province. (Inset shows Sichuan province in China.) Map courtesy of Google Maps and Google Earth. The valley, like most mountainous areas in China, suffered from severe logging, poaching, and over-fishing from the 1980s until the late 1990s. Despite China’s widespread logging ban, enacted in 1998, and the government’s confiscation of hunting rifles to put an end to illegal hunting around the same period, threats to conservation remained. Deprived of their main source of income and receiving only meager government subsidies to compensate for its loss, timber-dependent residents of Guanba valley were hard-pressed to find an alternate way to earn money. Many villagers turned to hunting illegally, covertly cutting timber, and gathering valuable mushrooms and herbs, often at the expense of the panda’s habitat. Real change began in 2009 when Shanshui Conservation Center, a domestic environmental NGO, came to Guanba village. This outpost of 100 or so families, most of them living in one-story brick houses with a vegetable garden and some poultry in the back yard, stands at the entrance of Guanba valley. Shanshui’s goal was to help village residents develop less destructive livelihoods and take pressure off the valley’s ecosystem. With Shanshui’s scientific guidance, villagers revived a defunct government-sponsored beekeeping cooperative and formed a patrol team to combat illegal poaching and logging in the valley. Their efforts appear to have inspired a resurgence of wildlife, according to villagers’ accounts and scientific monitoring. In addition to the pandas, golden snub-nosed monkeys (Rhinopithecus roxellana), wild boars (Sus scrofa), takin (Budorcas taxicolor), tufted deer (Elaphodus cephalophus), and golden pheasant (Chrysolophus pictus) live in the valley. 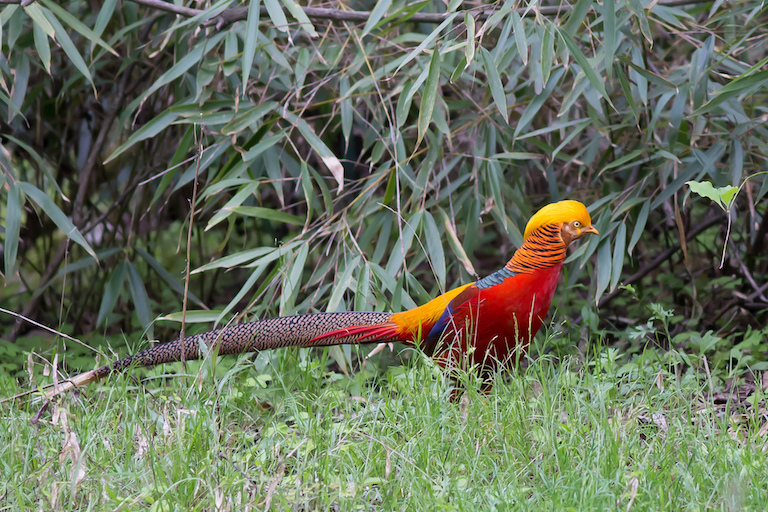 A golden pheasant photographed in Tangjiahe Nature Reserve, Sichuan, China. Photo by Jean-Marie Hullot/Flickr. In the beginning phase of the beekeeping iniative, Shanshui invited a Beijing-based company called Bee Panda, or Xiong Mao Feng Mi, to help brand and market Guanba village’s organic honey. According to the initiative’s strict requirements, the hives, home to an indigenous bee species, must be located at least 3 kilometers away from community residences to avoid the flower sources being polluted by fertilizers. And to ensure the honey’s quality, Bee Panda monitors and supervises the whole production process. Chen Yuanming, Bee Panda’s marketing officer, told Mongabay the company buys the honey from the local cooperative for more than 100 yuan (about $15) per kilogram, which is 20 percent higher than the average market price for a similar product. Zeng Guixu, 60, a beekeeper from Guanba village, tends 80 hives inside the valley. Photo by Wang Yan. “With stable income from harvesting honey, some local villagers no longer need to resort to hunting or intensive excavation of mountain herbs, and they also stopped herding, which might cause pollution for water sources,” Chen said. “Each year, 10 percent of the sales for Bee Panda honey will be returned to the local community for various purposes, such as improving beekeeping technology, enhancing equipment for wildlife monitoring, protection patrolling activities, or simply for the local village’s infrastructure construction,” she said. Bee Panda, though it remains a niche brand, is planning to explore overseas markets. Over the past seven years, Guanba’s beehives have proliferated from just a few to more than 500. In 2013, the village took on full ownership and management of the honey cooperative, having previously shared responsibility with ShanshuiLi Xinrui was elected chairperson by over 10 members and 34 shareholders, all Guanba villagers. The new cooperative has so far set up its administrative board, nailed down rules and regulations, and holds regular meetings for its members once every season. A Guanba beekeeper checks the spring swarming of his bees in April 2016. Photo by Wang Yan. Li Xinrui said that in addition to supplying a limited amount of honey to Bee Panda, the cooperative has launched its own local brand called Tibetan Fragrant Indigenous Honey, or Zangxiang Tumi, to explore both online and offline markets. “A big problem is that normally once the funding stops from some NGOs, such as Shanshui, things fall apart. So to attain long-term effects, we created our own brand, and are trying some incentive marketing mechanisms to sustain progress,” said Li Xinrui. “So far, our cooperative can support ourselves, the dividend yield for our shareholders was 40 percent of the market price in 2013 and 2014, then 80 percent in 2015,” he said. Li Xinrui, a man in his early thirties, believes honey production could help sustain both the village’s development and nature conservation. Guanba villagers release fish fry into the Guanba River in summer 2013. The village is working to restore a local catfish whose numbers had been reduced by overfishing. Photo Courtesy of Guanba village. With Shanshui’s help, Guanba villagers also started working to protect their local river, the Guanba, with similar success. According to Qiao Liang, a village leader in his mid-thirties, the river used to teem with a local catfish called shipazi(Euchiloglanis sp.,). However, shipazi is considered a delicacy in Sichuan, and in recent years the price rocketed to over 1,400 yuan ($214) per kilogram. Qiao Liang told Mongabay that for the past decade, the fish could hardly be spotted in the Guanba River. 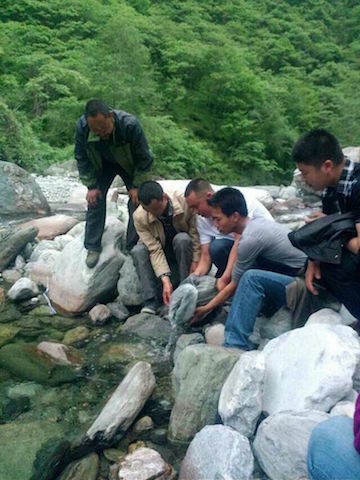 “There were people from both inside and outside of our village who went to the river and used poison or electricity to catch shipazi, a species listed as a protected species by our local Sichuan Province,” Qiao Liang said. “Since we set up a patrolling team in 2009 and stationed some trap cameras to monitor both wild animals’ and people’s activities, we caught quite a number of people on site fishing illegally,” Qiao Liang said. Since 2013, Guanba village has been releasing juvenile shipazi each spring, and the population has revived significantly. “To inspire other villagers to want to protect the environment, we are considering fishing and selling a small number of the population after this year’s breeding season as our next step, then distributing the profit among the villagers to make everyone see the effect and benefit of protection,” Qiao Liang said. He added that Guanba village has plans for other ventures, including the cultivation of indigenous walnuts and certain valuable herbs, and in the long run eco-tourism. “Spending some 10,000 yuan [$1,500] on the fish fries brings us over 500,000 to 600,000 yuan [$76,300 to $91,600] profit. And more importantly, the invisible benefit of our conservation effort is that the presence of fish in our river is a sign of our sound natural environment, which can attract tourists,” Qiao Liang said, his eyes sparkling with confidence. Guanba villagers release fish fry into the Guanba River in summer 2013. The village’s effort to restore a local catfish species is paying off, with the number of fish rising. Photo Courtesy of Guanba village. Projects both inside and outside China have shown that displacing local communities from their traditional lands, restricting their access to resources within protected areas, and providing little or no compensation, can make them hostile toward conservation groups and projects. Often this has led to conflict, compelling the communities to flout the rules and harvest or hunt illegally. This was, and to a much lesser extent remains, the case in Guanba. “Local people have a basic stake in the land, their livelihood is not expendable, and any management solution must also consider their interests, knowledge, culture, and cooperation… Ideally, communities should take the initiative in protecting and managing their own resources: conservation ultimately depends on their goodwill and participation,” write ecologist Anthony Sinclair and conservation biologist George Schaller in the foreword of the 2010 book Wild Rangelands. In Guanba valley, the forest covers 133 square kilometers (51 square miles), and its ownership is complicated. Because the local Pingwu Forestry Bureau doesn’t have enough staff to patrol the entire region, Guanba village set up its own community patrol team in 2009. It pays for the team with the annual subsidies it receives from both the central and provincial governments to compensate for the economic losses caused by the protection of local forest. (Most other communities simply split the subsidies among residents.) The enhanced supervision has cut down on illegal activities within the protected areas. In China, there are a total of 60,000 such community protection programs employing various methods, with around 300 of them in Sichuan Province. Guanba is a particularly successful model; most of the other programs nationwide remain in nominal existence, having been set up by local governments but without sound mechanisms or funding sources. A traditional beehive made of a tree trunk in Guanba valley. Photo by Wang Yan. Feng Jie, Shanshui Conservation Center’s program officer in charge of the Guanba project, told Mongabay at his office in Chengdu that self motivation is the key force driving the Guanba village community to protect its environment. “The limited government subsidy for forest protection each year can hardly meet the real loss villagers incur from deprived livelihoods. So enabling the community to directly benefit from protection can arouse their motivation,” Feng said. “In the case of Guanba, the honey, fish, and walnut industries are all closely linked with water and forest,” he said. For communities, sometimes economic development and natural-resource protection can benefit rather than contradict each other; the trick is to find the balance between the two with a stable and financially sustainable model. Guanba village comes close, but its honey cooperative does not generate enough income to support all of the villagers. Li Xinrui, Qiao Liang, and other locals hope that by adding walnut cultivation, fishing, and other initiatives they will be able to sustain themselves while still preserving their environment. 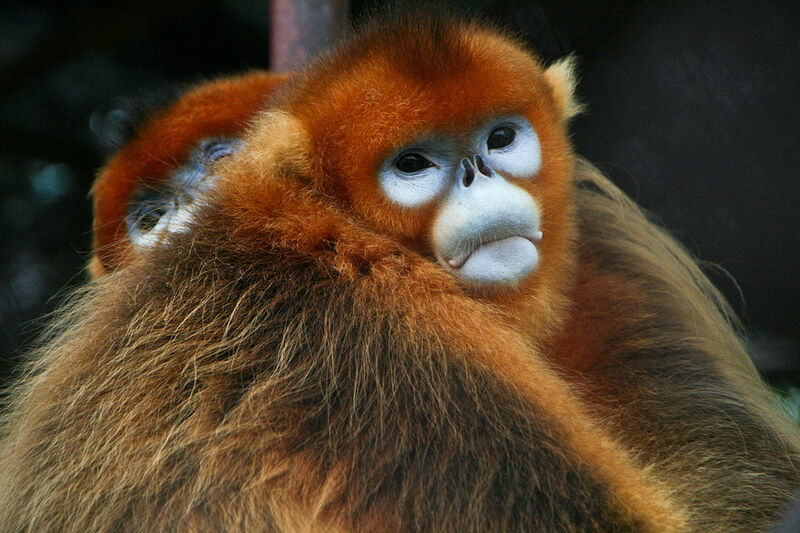 Golden snub-nosed monkeys in captivity near Xi’an, China. The species lives in Guanba valley. Photo by Jack Hynes/Wikimedia Commons.